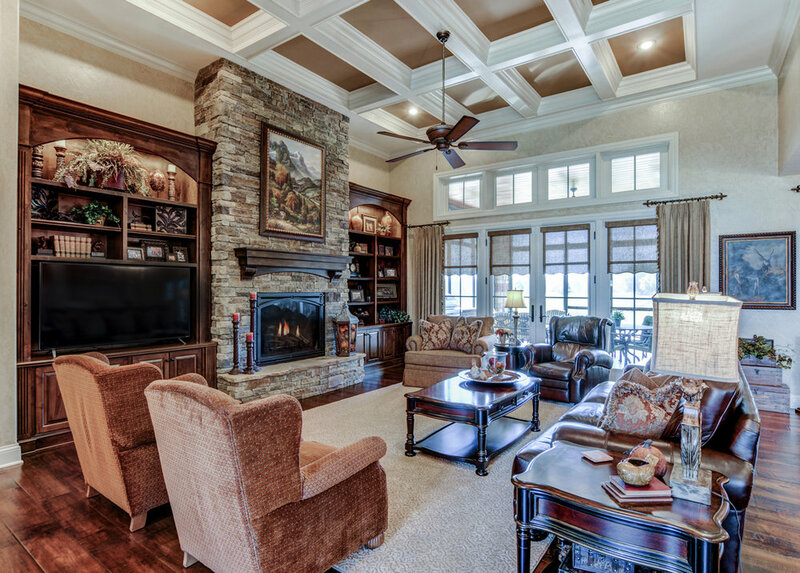 Custom built French Country-inspired custom home is on the refined side of this style in southwest Missouri. Grandma’s house 2.0. The grand kids where a large focus of this spacious story and half set along a fence row of 100 year old Persimmon trees that boarders the eastern edge of the great plains. This French Country inspired custom home is on the refined side of this style. Being able to serve and entertain guest and family gatherings from the well appointed kitchen and dining area were of great importance. This area opens into the great room; the center of attention. There is a lot to take in: The tall coffered ceilings, hand scraped floors, glazed, hand textured walls and the french patio doors that open onto a wonderful screened porch set up for great outdoor entertainment. The hand-forged custom barn door hardware and the reclaimed wood mantle are just a couple items that make this outdoor area unique. The mantle still has the original barn paint and a carefully installed tin patch as old as the barn it came from. Another unique item that is one of the clients favorite are the doors leading into the office. These antique doors came from a late 1800’s St. Louis home with the original hardware. This custom home project was a fun mix of the old and the new.